Several thousands of enterprises are currently performing their first IoT projects – whether its smart factory, connected car, or smart energy – most of them now consider using a modular IoT software platform to manage the data flows, support application development and provide basic analytics. This promises lower cost, faster time to market and more professional support. The IoT Platform selection process is not easy, however. There are hundreds of platforms to choose from with prominent examples being Microsoft Azure IoT, Amazon AWS IoT, PTC Thingworx, Siemens Mindsphere, GE Predix, Software AG Cumulocity IoT, or C3 IoT Platform. However, several instances have now been reported where the IoT Platform did not live up to the task. In one instance, the platforms data model proved to be limited to one industry specific scenario and could not be scaled to other use cases for the same company. In another instance, support for multi-cloud backends was not available and hindered the end-user to exchange important data sets between different platforms. It is becoming crucial, for most companies even strategic, to ensure they are choosing the right IoT Platform that will seamlessly manage their IoT data flows. Not only for one use case but for most, if not all, of the planned use cases in the years to come. 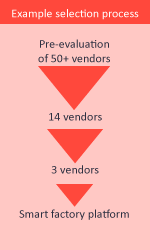 Almost all of the customers interviewed use some kind of criteria catalogue for pre-selecting vendors. In one extreme instance a customer used a catalogue of 130 different dimensions. Most interviewed customers used a combination of 17 distinct criteria. 8 of these can be classified as customer-specific (These are criteria that every customer rates differently based on their own needs and perception). 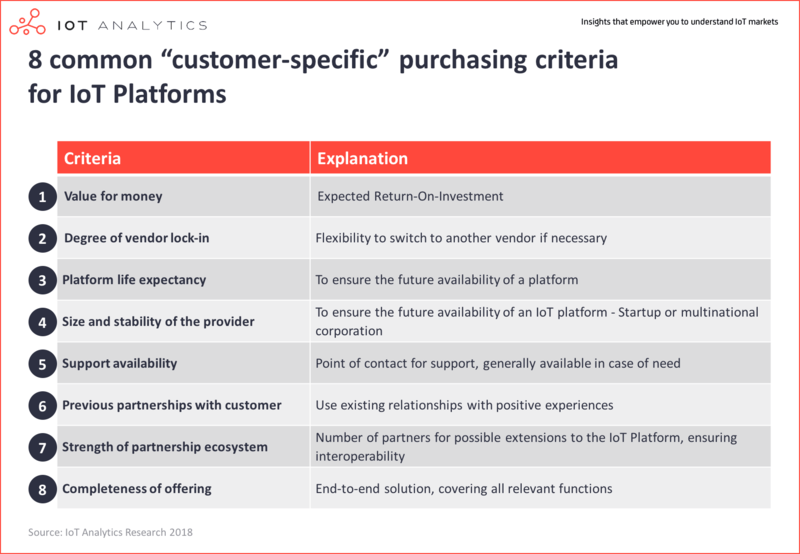 Vendors can have a greater influence on the 9 Platform specific purchasing criteria (listed in Table 2) as these aspects are directly linked to the IoT platform’s capabilities. 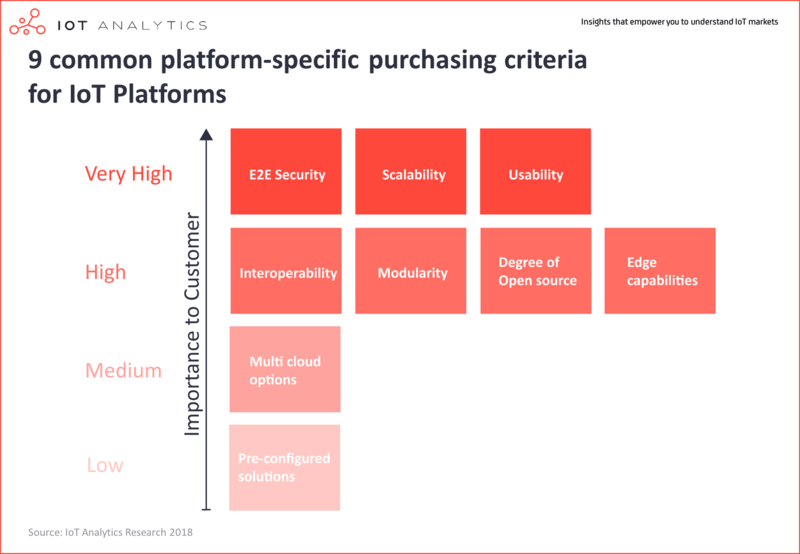 These Platform specific criteria have been ranked by customers regarding their importance in the IoT Platform selection process (based on our interviews). It is worth noting, that the pre-selection process can differ on a company by company basis ranging from assessing a handful of vendors to tens of vendors. For example, while some customers mentioned they only looked at 2 vendors, one specific customer even had 50 IoT Platform providers on their initial list of potential platforms. Clearly, available budget and timing playing a major factor here in the decision process as not all customers have the resources to assess 50 platforms. In any case, the aim is to narrow the options to a few chosen vendors before completing a proof of concept. It is somewhat surprising to see that the selection criteria vary so much between different companies. For example, one company put a heavy emphasis on open source while another company totally neglected that aspect but instead focused heavily on end-to-end security. After short-listing a number of platform vendors, most companies run real-life PoCs to test the platform performance and capabilities using different technical criteria (e.g. amount and quality of functionalities, tools and services, usability, security, interoperability, etc.). Often, other factors like cost and platform ecosystem are taken into account in this step. Instead of asking vendors to present some hypothetical capabilities, IoT platform customers oftentimes setup a real-world testbed which resembles their actual product or production process and contains actual data sets from their products or factories. One manufacturing customer revealed “We’re essentially at the beginning of our digital journey, so we don’t want to commit to a specific platform from the start – instead we’re trying out different platforms before committing to one or more for a long time”. In essence, many customers are using PoCs to explore and “play” with the platforms to see how they work and what advantages they can get from them based on real usage scenarios, while keeping their eyes open for other options. The following example presents the IoT platform selection and evaluation process of a machinery manufacturer in Germany looking to build a Smart Factory. First, the company built a qualitative capability map, which included over 130 features based on the company’s IoT solution needs. Secondly, the company investigated a range of vendors on the market and came up with a list of around 50 potential vendors. Fourthly, the company selected 3 vendors to run PoCs onsite. Based on the PoC outcomes, recommendations were made to the board by a large evaluation team, and then the board (including the CEO) made the final decision on IoT platform selection. 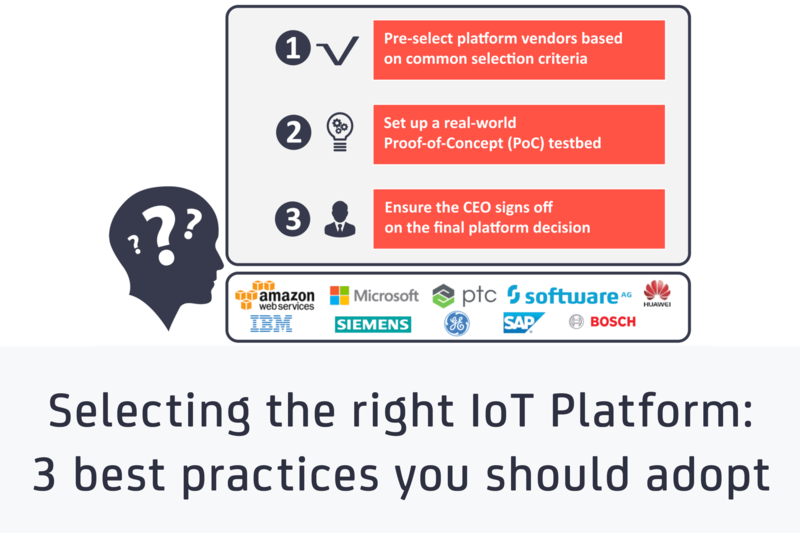 The following example presents the IoT platform selection and evaluation process of an Automotive OEM looking for a smart factory platform (not a connected car platform). First, based on their internal analysis, the company pre-selected 10 vendors that were invited to perform 2-day PoC’s in a real production setting. During the PoC’s the competing platforms were tested on usability, interoperability, and other technical factors to assess their suitability. Following this stage, the automotive OEM kicked out vendors who did not deliver what they needed – some of which didn’t even deliver what they were promising. The remaining 2 best vendors were selected for a further 3-month PoC for in-depth assessment in the production environment. A steering committee (made up of technical profiles and managers) made a recommendation to the management team (including the CEO) based on the PoC performance and cost. However, in this case the final IoT platform selection decision was taken by the Head of Plant Automation. Best Practice 3: Ensure the CEO signs off on the final platform decision. As choosing an IoT platform is an important strategic decision for any organization, in most cases, the final decision is taken by the CEO and a management team or a board of directors including the CEO. Customers are challenged to choose the right IoT platform for their needs that is fit-for-purpose now and future-proof in-line with their technology roadmap. Learning from others and following these 3 best practices can help choose the most appropriate IoT platform. It is surprising to see that even if the criteria are somewhat similar, the outcomes are different for different companies. Example 1: One company chose to go with a vendor stating that “even though there were gaps in their product portfolio, they seemed to be the most believable firm to close those gaps and be serious about a future partnerships”. 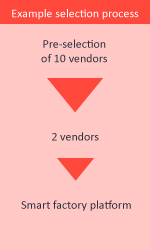 Another firm, kicked out the same vendor early-on in the selection process due to “lack of performance”. Example 2: One company raved about the capabilities of an IoT cloud platform while another one lamented the lack of domain knowledge this provider would bring along. Using several different platforms in the exploratory phases can help customers compare and understand which platform works best for their needs. In some cases, companies even build up a test lab with real data – then invite the shortlisted platform vendors to connect their platforms and show what they can do. But ultimately, it’s a management decision and the CEO typically has the final say – so choose wisely. 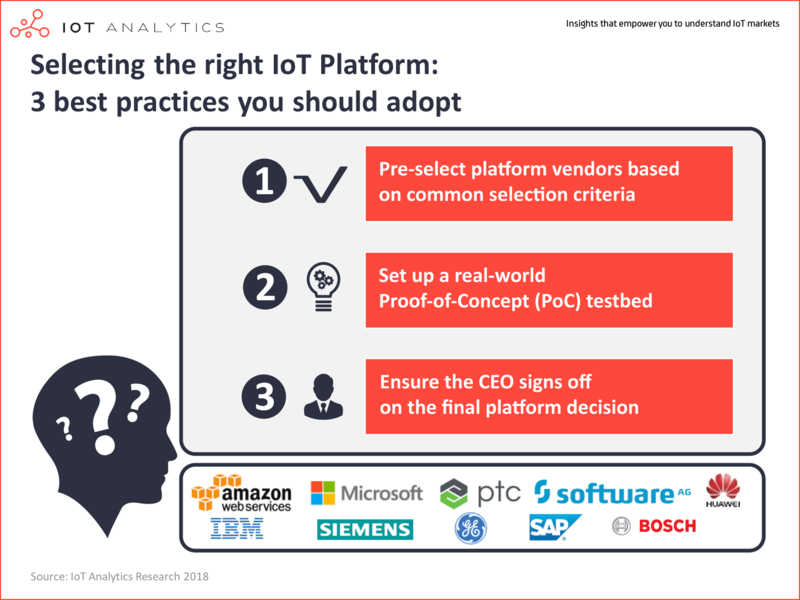 Are you in the middle of an IoT platform selection process or have just completed one? In that case we would like to hear from you. IoT Analytics has been monitoring the topic of IoT Platforms since 2015 and our analysts would love to share our perception and in exchange hear about your point of views and best practices. Are you interested in further reading? If you want to understand more about the IoT platform selection process or the IoT platform market in general (e.g., What do customers say about individual vendors? What building blocks do each of the platforms offer? Which market share do individual platforms have? And much more) check out the IoT Platforms Market Report 2018-2023 & Vendor Comparison 2018. These reports, published in June 2018, offer more in-depth insights on the IoT platforms market (193 pages) and competitive landscape (450 pages). In case of questions you can contact the author HERE. Informative post. The way you explained IoT platforms and key points to be considered for choosing an IoT based product gives it more value and make it easy to understand. Great read! Your breakdown on deciding on an IoT platform makes it easier to understand and often complicated topic.